The lowly dandelion has always been one of my favorite flowers. While I can’t bring a bouquet of them inside and place them in a vase, I do enjoy finding one of these treasures outside. Now, I’m sure all you gardeners are wondering why on earth I would love a weed, but just follow me for a minute. A sense of wonderment comes over me when I see one of these cotton ball blooms. I instantly want to pick it up and blow until every little part of that puffy blossom is floating on the breeze. Maybe it’s the kid in me, or maybe it’s something more. I recently learned from my less than pleased landlady that, while dandelions are a treasure for some of us, they are a curse to others. Our newly sodded yard suddenly had dandelions popping up pretty much everywhere. She was definitely not very happy with me for allowing these weeds to live in her garden. It made me want to research dandelions all the more. What I found was that dandelions grow everywhere in the northern hemisphere, and that they actually thrive the more you pull them. Even more interesting was that the dandelion is first a bright yellow flower that then dies and dries up, leaving it to turn into the identifiable white bulb that I am always delighted to find. Not only that, but as I found out from my lovely landlord, every time one of those white cotton candy-esque flowers is wished upon and blown, hundreds of new seeds are planted. You may read all that and think “OK Shannon that’s great that you embarked on a 6th grade level science project research mission, but what does this have to do with anything, and why am I still reading your blog?” Here’s my point. I imagine each of our lives as one of those dandelions. We are beautiful, simply because God created us, we are His, we are loved, and we can be one hundred percent secure in that love. But, we are also guaranteed some hard times in this life. We can know that we will face sadness, sorrow, and despair, which can cause us to wither. We can be left to feel like those little white blooms, dried up and completely fragile. The true beauty of the dandelion lies in the way that it propagates. Every time an excited two year old (or an -ahem- thirty something grown woman) blows on one of these puff balls, we are planting hundreds of new seeds. From something dead comes new life. Now do you see where I am going with this? Isn’t it amazing!? How many times has God used your hard times to encourage another person in their struggles? God takes our dried up, broken down, dead lives, and allows us to plant new life in someone else, but we had to die first. It is no mystery to God who your life will touch. Each of the little seeds that are sent into a flurry are shaped like a flat little umbrella. They float about until they reach a destination (unfortunately for my landlord it’s usually the new grass). The seeds of hope that came from your tragedy will take off and land and take root wherever God has planned for them to land. You never know who your story will touch, or when someone will need it. Now you see why I have a love affair with dandelions. We are all little dandelions that go through seasons of growth, change, death and rebirth. God is constantly causing us to grow, allowing us to hurt, and always using us to bring hope. I am more than willing to be broken for a time if it causes another person to see that they are not hopeless, and that God is not finished with them yet. 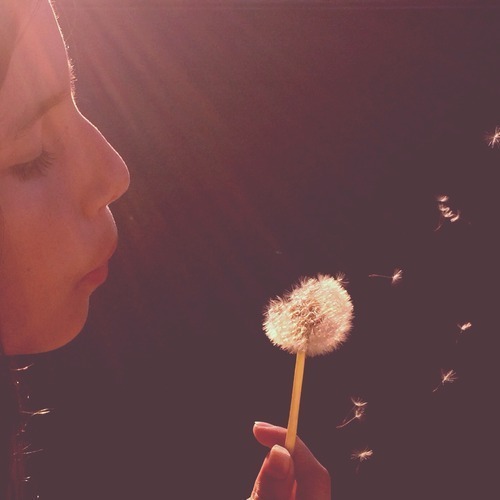 I hope that you will never be able to look at a dandelion the same! When you are aching for Jesus to take the pain and the sorrow, and make you new again, remember that He is doing just that. The seeds He is planting in you will go farther and reach more people than you could ever imagine.